Making time to do the many things around home which mean much to my gentle domestic heart isn't always easy. Mr E and I both had a busy Saturday attending to our various work commitments and on Sunday we spent the day in recovery mode, however, come Monday morning we were still quite weary and I suggested we take a leaf out of Hobbit lore and substitute their second breakfast for a second Sunday. Good idea, but not to be, he replied. With hubby's lunch made and packed in his bag I waved goodbye as he drove off to work and prepared myself for a day with Blossom and her girls. Ross was returning to work after paternity leave and as this was the first day she would be on her own with Cully May and Rafaella, I'd suggested we go out to the coolest and quietest shopping centre in town and trial her double pram. She'd not left the house since coming home from hospital so was eager to see what life was like 'out in the real world' with a baby and a toddler. Having me there as an extra pair of hands would ease her in to what would now be a regular part of life. We had a lovely day, and the little girls were wonderful. Funny thing, though, Blossom forgot to switch from the single pram she has used for Cully these past 19 months to the double so when she opened her car boot she realised our 'plan' now had a hiccup. Never to mind, she had her baby wrap in the car so we popped Cully in the pram for me to push and Blossom wrapped Rafaella to her chest in the snug carrier. We started with a morning tea of coffee, tea, juice and cake at a cafe, chatting away for almost an hour while the baby slept and Cully May scooped the froth off my soy chai latte, licking her lips with every spoonful. Following a list of what she needed to purchase we slowly made our way around the large shopping centre, bumping into old friends, and adding the occasional treat along the way. Since Blossom was young we've shared a love of pajamas and now that she is no longer pregnant we thought the best thing to treat ourselves with was a pair of pajamas. Myer had a really good sale on our favourite brand so we both came home with a nightie and a pair of pajamas each. That night we were texting back and forth about how exhausted we were, but how satisfied we felt to have spent precious mother/daughter/granddaughter time together. Tuesday dawned and I knew my house needed attention! The steam cleaner man was due at lunchtime to 'revive' our old blue couches and the living room rug, all of which bore a 5-year evidence of dog and cat sleeping arrangements, to the point we could not ignore the stains and odour any longer. SO....I gathered my energy and did four loads of washing, a complete scrub down of the ensuite bathroom and shower, total cleaning out of the back verandah, washed the dog, scrubbed the laundry and gave the house a good vacuum. The steam cleaner man arrived at midday and leaving him to do his magic I headed into the sewing room with a glass of sparkly water and Bob-the-dog. 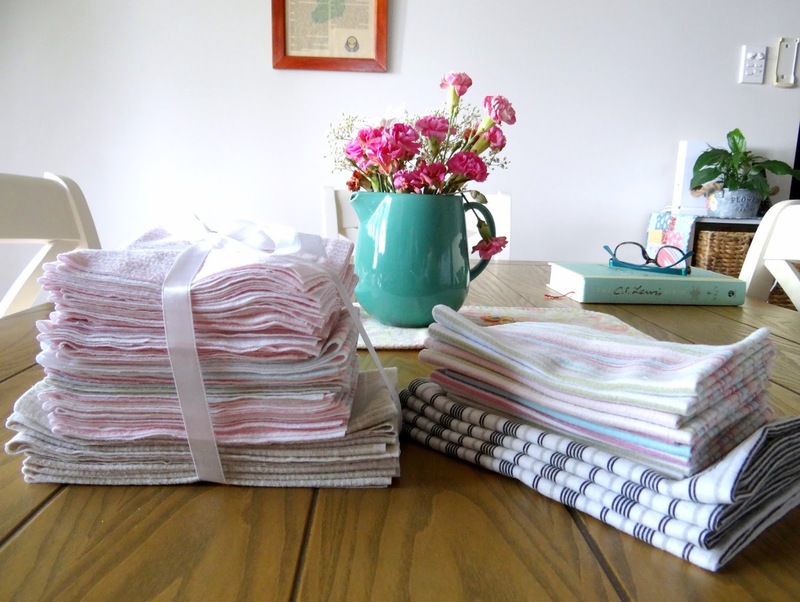 I read on Annabel's blog how she cuts up old flannelette sheets into small squares for hankies. The softness of these flannie hankies isn't harsh on the nose the way a tissue or cotton handkerchief is, but are gentle and soothing when a family member is down with a runny nose and head cold. I purchased some flannelette sheets and pillowcases at the local op shop last week to make a supply of soft hankies for Blossom and her family, as well and Mr E and I, so while the couches were being cleaned that's exactly what I did. The larger hankies are man size for Ross, and the pink and pastel striped ones are perfect for Bloss and the girls. In the pile on the right the black stripe are my hubby's and there's more pastel striped ones for me. I still have plenty of flannelette to use but this is a good start! Today I've been in the kitchen all morning, as well as making up some cleaning and skin care items, so I thought I'd share a few things with you. Blossom and I both love using the Miracle Spray on surfaces, but another idea for it which may have been on Annabel's blog or perhaps on someone else's (sorry, can't remember) is to clean out the squeeze bottle your toilet cleaner came in and refill with Miracle Spray. The shape of the spout gets right up under the rim of the toilet. I added extra eucalyptus oil to the mixture for this purpose because the smell is beautiful and a stronger antiseptic in the loo is my preference. I've had a lot of emails and messages asking what is the US equivalent to some of the ingredients we use for Miracle Spray in Australia. 100% pure eucalyptus oil is in every supermarket and chemist here, but apparently not so easily found in the US. I had a look on amazon and this one is fine. It's inexpensive and 100% pure (there are others that cost more on amazon but there's no need to pay through the nose). 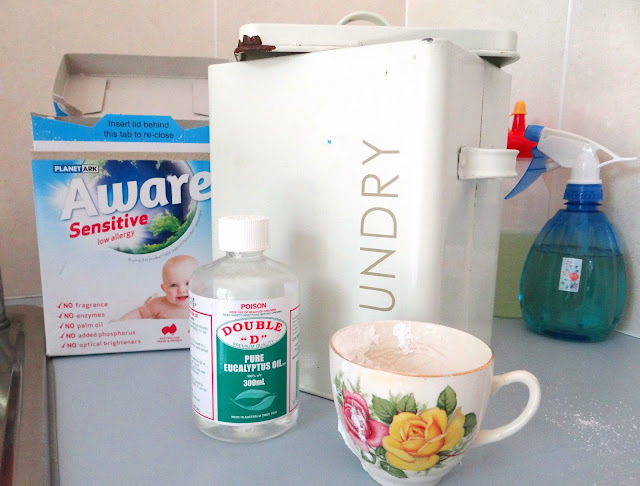 Lectric Washing Soda is the same as Arm & Hammer Washing Soda in the US. I used to make my own laundry powder as well, but I actually didn't like it as much as the Planet Ark's Aware brand we've used for years. I cut costs by buying boxes of Aware in bulk when it's on special, sometimes at half price. I pour a box of Aware into my laundry powder tin and add 2 tablespoons of eucalyptus oil, giving the whole thing a good shake while I hold the lid tightly shut. Yes, the smell is amazing, but eucalyptus oil also kills germs in the wash, and it cleans the hoses in your washing machine during the rinse cycle. Good, huh?! And that pretty but crazed tea cup? That's my laundry powder scoop. I think it was Aunt Ruthie who gave me the idea. The point being to make your laundry a desirable place to be by adding pretty things, like a china tea cup for a scoop. I'm planning to sew a pretty peg bag later this week (or maybe on the weekend) and add a few other nice things to the laundry room as well. Blossom asked if I'd make her some blackberry jam. As fresh blackberries cost an arm and leg in the tropics I opted for frozen ones. 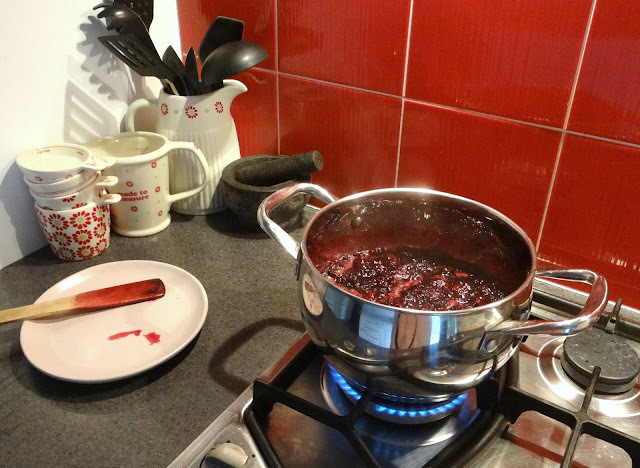 Having never made blackberry jam before I just went with my stock standard jam method and prayed. Bless my girl! 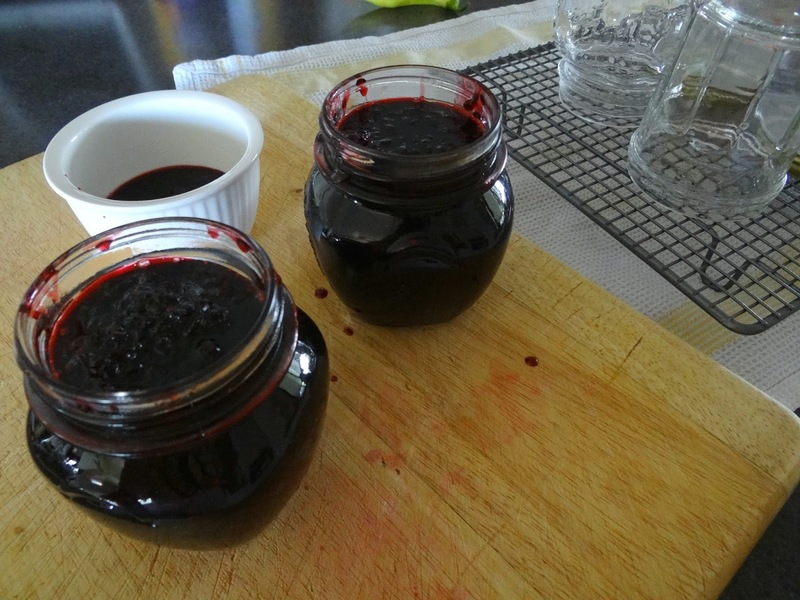 This blackberry jam cooked up a treat and when I tasted a wee bit on some bread before popping it in sterilised jars it was delicious. Now, when I'm not sure how long I need to keep a jar of jam I create an air-tight seal by placing the lid on my jars and turning the jars upside down until they are cold. As the jam cools in the jar it pushes out all the air, strangely enough, and the little pop top in the middle of the lid is sucked down to create an air tight seal. This technique has never failed me. Oh, and another tip is to store opened jars of things like tomato paste, mayonnaise etc in the fridge the very same way. I have had tomato paste in my fridge for months and months stored upside down and when I open the jar it's a fresh as it was the first time I removed the lid. ...along with the rest of Blossom's bounty, which also includes a little container of pure coconut oil. For many years I have used rosehip oil on my body as it's a natural healer of sun damage, and in the tropics it's hard to avoid the sun. However, I also used a rosehip based skin care cream which was quite expensive. The cheaper versions seem to be made for younger skin, but at age 59 this enriched cream suited me far better. Well, it has for a number of years, but then its been a very hot and humid summer/autumn and the other day I noticed the cream had a rancid smell and should probably have been stored in the fridge. Not wanting to spend all those $$ again I remembered something Jess wrote about using pure coconut oil on her face and skin and how it had improved dramatically. We use pure organic coconut oil in raw foods and to cook and bake so I always have a jar in the cupboard, and I had also found a few little plastic squeezy bottles still in their box from when I tidied the kitchen drawers in the new year. So I have filled one for Blossom and one for myself. You only need a drop in the palm of one hand, then rub it gently into your hands before using them to spread it over your face, neck and elbows. It's beautiful, not greasy, just absorbs as though your skin is super thirsty. This costs me less than 1 cent a day. Well, you can see there's been a bit of this and that happening here and I've rambled along with it all for long enough. Bless you for reading through, and I do hope you found something useful along the way. 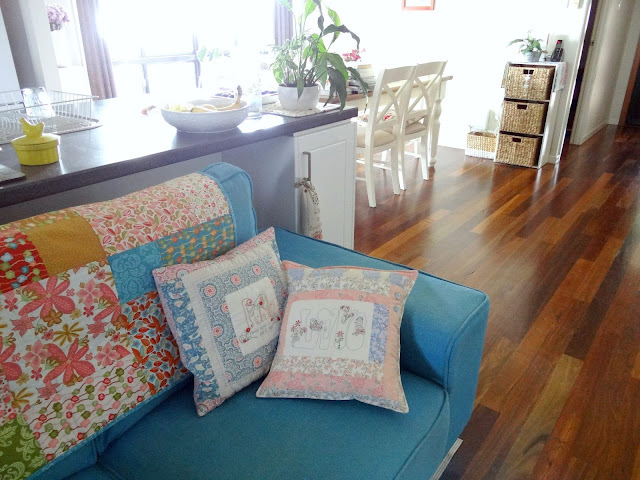 Our old cotton couches are clean and fresh, and I finished my 'Love' stitchery as a new cushion too. Tomorrow and Friday I can stay home all day and potter around, maybe do some baking for the weekend and sketch up a few new designs. The Jeep will be off the road (yes, again) for a while, but this should be the final repair, so I will be without a car for a bit...and that doesn't bother me because being home is where my soul thrives and my heart is at peace. 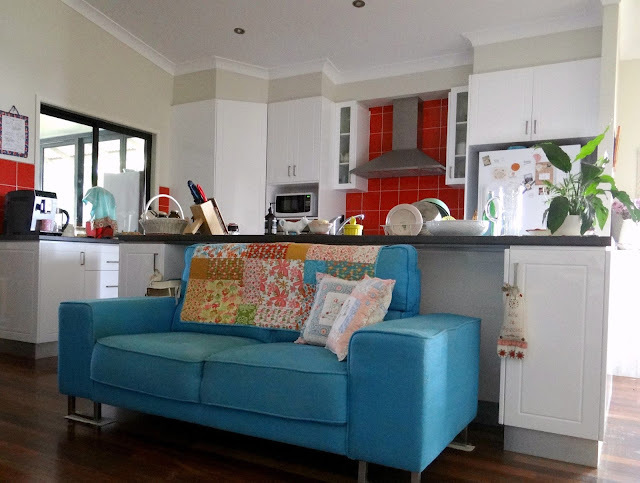 I should probably mop the floors (least favourite chore) and I will, but apart from that the house is clean and things are up to date so you can expect a few photos next time of things being accomplished in the sewing room. Unless life steps in, which it is apt to do. God bless you abundantly with every good and perfect thing, and may your heart find joy in the simple things each day has to offer. I savored every word. I have a question for you. I live in California where drought is prevalent. Is it more environmentally friendly, do you think, to wash flannel squares -when water is scarce, which it always is where I live, or to use kleenex and destroy so many trees? I wonder the same thing about napkins. Any thoughts? I do suffer from allergies and my nose gets so raw! Many thanks. Made me smile. Thank you Jenny. This was such a lovely post...and such a blessing to be able to sit under the wisdom of a true Titus 2 lady. I absolutely love the idea of the Miracle Spray, and will definitely be looking out for the ingredients in our market. I do believe that we have several of them on hand already in the cupboards. 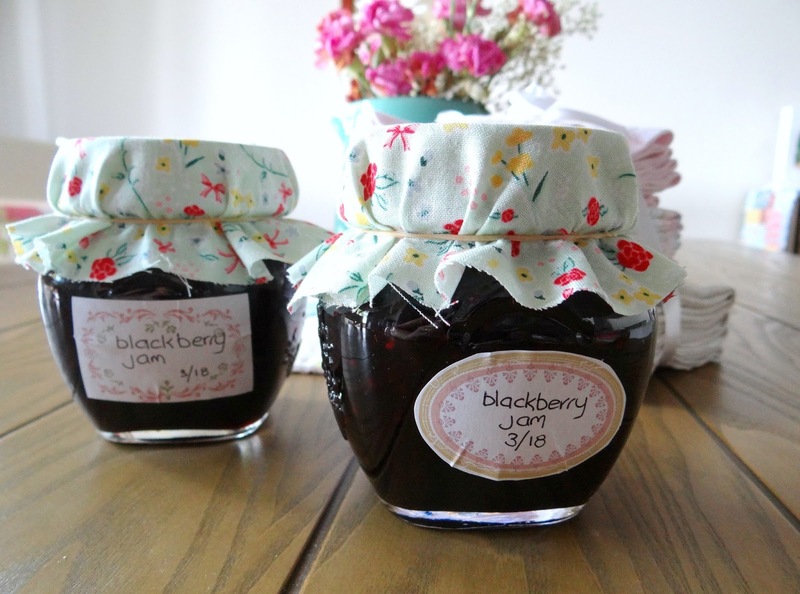 Your jam looks delightful as well, and I'm sure it tasted heavenly! I love how you decorated your jars in such a simple yet beautiful way. It was lovely getting to come by for a visit...thank you for always sharing such beautiful, encouraging posts that truly reflect a heart for home, family and the Lord! Your posts are always lovely to read and always offer some very useful ideas. Cutting up old sheets is a great idea. I was saving them to back some cot quilts but I think I might make some cloths for baby's bottom as they are so soft. Does steam cleaning remove stains? My poor sofa has a huge water mark on it after I attempted to gently remove a chocolate stain. Hubby's armchair has stains where he puts his head on the wing back. At least I do not have to scrub too hard in the shower as we use a natural body wash and it doesn't leave that soap scum. Your day with Blossom, Cully May and Rafaella sounds lovely and at least Rafaella slept a while. My munchkin always wanted to be breastfed as soon as we sat down to coffee. Now he wants everything we eat even when he has eaten! Hollow legs. Those muffins look yummy. I hope Blossom settles in with her new extended family. Jenny, I have had the ingredients to make the Miracle Spray for ages now but still haven't made it up. 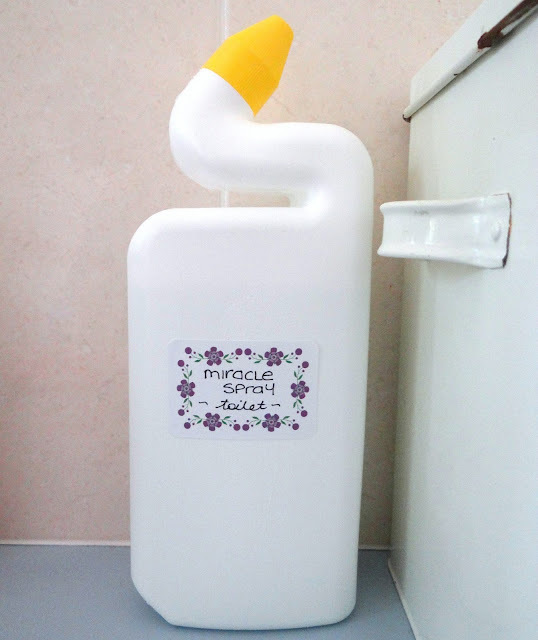 Just a note about the Eucalyptus Oil...in the post on My Abundant Life http://myabundantlife07.blogspot.com.au/2014/08/miracle-spray.html about the spray which was originally from a member of the Cheapskates Club, Wendy says to use non water soluble Eucalyptus Oil (I found the Thursday Plantation brand in Woolworths) and she also says not to use it on timber or mirrors. As we have a timber house I have been a bit unsure about whether to use it but I will make it up seeing as I bought the oil and check it out. Annabel has a beautiful blog... just like yours. Such a lovely post. So happy to hear that Blossom and baby and Cully May are doing well. Loved reading about your cleaning and Jam making and how you care for everyone around you - special blessings. I never knew when I joined your embroidery club that I would also have the bonus of these lovely posts. 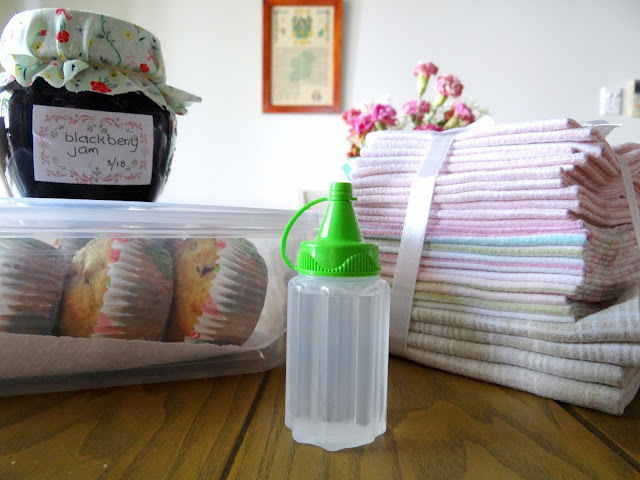 I am retired after almost 40 years in the work force so I am learning to be a homekeeper. My husband has also done 99% of grocery shopping and cooking for 36+ years of our 39+ years of marriage! So I am learning to cook and keep house. It is a full-time job! I am busy all the time, but luckily have time to renew my love of the fiber arts. I started embroidering again after a 40 year hiatus from it and am just loving it. Thank you for this post. I read it before bed last night and feel renewed today (though a bit overwhelmed) because I have a day with my 3 year old granddaughter, then pick up her 9 year old sister at school and take her to sewing class at the local quilt shop. It is my day to be grandma! Congratulations on your new baby. When I had babies, before baby wipes, I cut up some older, soft, cloth diapers into squares. Zigzagged around the edges a few times and used them as baby wash cloths and clean-up. Threw them into the diaper pail and when it came time to do diapers, these got washed and bleached too. Done the same thing with towels as the large ones make 6 washcloths for adults (larger than store bought). Zigzag the edges 3 times. The wavy edges go down after washing and drying. 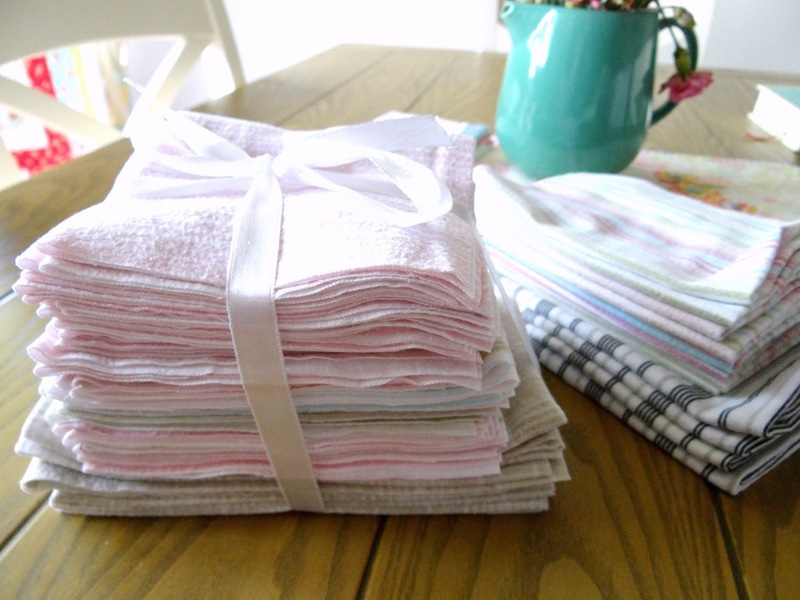 Beautiful post dear heart, my dad always used hankies and they really are so much softer. I use coconut oil on my skin, hair, and as a toothpaste! I mix it with baking soda and keep it in a little container. I have to nuke mine to soften it though I imagine yours stay soft, lol. Too cold here! Enjoy the beauty around you, sweetheart! Your posts always make me smile and feel happy. You are a sweet soul. Hello Jenny; I found your post today so interesting and full of fabulous tips that I will be using! My husband discovered canning and absolutely loves the whole process. One of his favorite parts is to create a variety of Jams and Jellies, Blackberries grow wild here on our property and well everywhere in Southern Oregon and are free for the pickings. You just have to be careful to not pick the areas where they spray. We will definitely use your tip about turning the jars upside down and in the fridge also! Thank you for another marvelous post that just makes me feel happier. Have a great day! I always enjoy reading the whole post. As for cloth hankies, I have been using washcloths for napkins & birdseye diapers for hankies for over 30 years & just mix them into my other loads of clothes so they don't really create extra laundry. I think Jenny's flannelette would be extra soft on the nose. Una entrada bellísima y muy completa ,me encanta todo lo que nos explicas y enseñas !!!!!!!! What a sweet beautiful day with your girls. And don't you just love doing the home things for them even though Blossom is all grown up! Thanks for sharing your day. Even the mundane cleaning parts of our day are more encouraging when we remember women all over the world are homekeeping just as we are. You make me tired just reading of all you have achieved. I didn’t know the upside down jar trick. 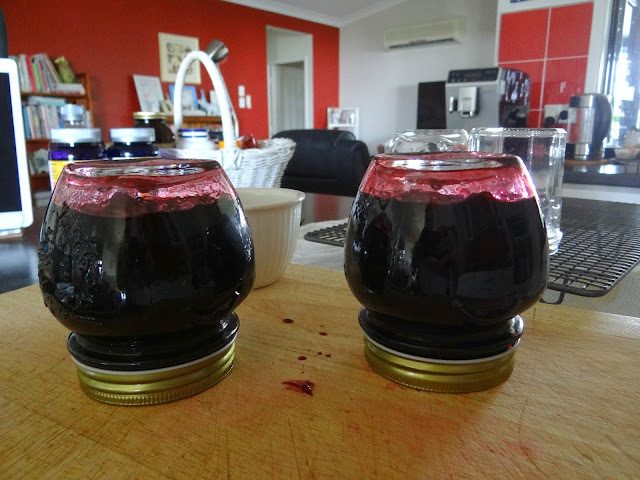 A couple of my latest jars of jam didn’t pop, so I have just put them where they will be used first. I bought the ingredients for miracle cleaner yesterday, so will make it up and give it a whirl tomorrow. It’s good you were able to join Blossom in a shopping outing. It sounds like you had @ fabulous time. Jenny, l redid my laundry room a number of years ago, too. It is such a happy space now. But yesterday I downloaded your pattern for joy in the ordinary for the walls. Did you use single thread to do it since it’s on the small side? I can’t wait to add it to my walls. It’s going to be so pretty. "Joy in the Ordinary" was stitched with 2 strands of thread. The applique was done with one. Thank you so much. I love your designs and the sweet ladies who are part of the FB page. I am so glad that I found you all. I have found my kindred spirits! What a lovely time you had together. Wish we could buy eucalyptus oil like you seem to, that bottle is huge. It's very expensive in the UK, cheapest I've found on eBay is £8 for 100ml which I think would be about 14 Australian dollars. Should be able to get the washing soda OK & it looks like it makes a great cleaner. 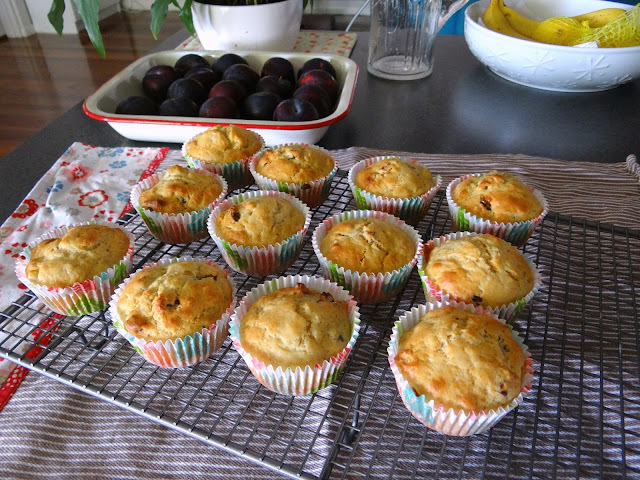 Those muffins look delicious, I love dates & banana, Cully May will love them I bet. Love the colour of your settees, gorgeous. Hi Jenny! 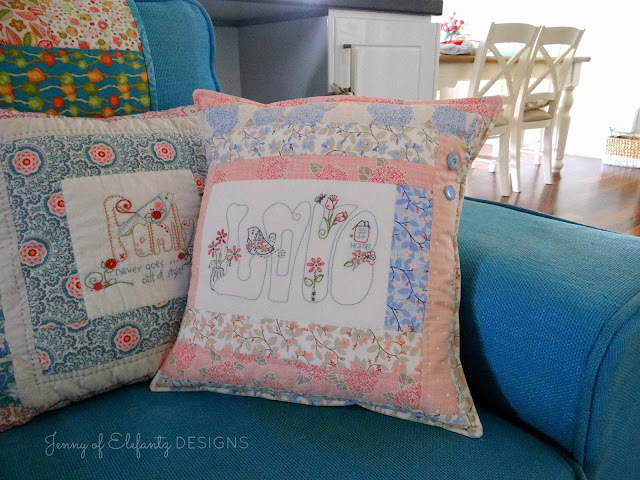 I am glad I found your inspiring and amazing blog!Adorable embroideries...Great posts!Thanks for sharing and Happy Easter.Hugs! Carol, you asked "Is it more environmentally friendly, do you think, to wash flannel squares -when water is scarce, which it always is where I live, or to use kleenex and destroy so many trees?"